Good eye sight when driving is important to ensure you are not endangering yourself or other road users. If you need to wear glasses, it’s a good idea to carry a spare pair in the car in case you damage or lose the pair you are wearing. In some parts of Europe it is a legal requirement to carry a spare pair of glasses or contact lenses in the car. It is also advisable to keep your car windscreen clean on both the inside and the outside to ensure you can see clearly. Also check that the windscreen is not scratched and the headlamps are clean. 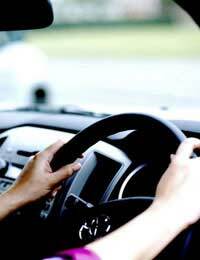 Driving with poor eye sight is a criminal offence which could result in a fine. Although drivers have their vision checked when they have their driving test this is only a basic test to check how far you can see in the distance. Drivers are not legally required to have an eye test until they are 70 years old, although it is recommended that all drivers have an eye test at least every 2 years, even if you think your eye sight is normal. All drivers must be able to read a number plate which is 20.5 metres in the distance. If you need to wear glasses or contact lenses you are allowed to wear them for the test and you must also wear them whenever you are driving. If you do not wear your glasses or contact lenses when driving you are breaking the law. If you drive when you cannot see clearly and you do not meet the visual requirements, you could be fined up to £1,000, receive three penalty points or be disqualified from driving. Some glasses are better than others for driving. Glasses without a rim or with thin rims allow greater all-round vision than those with thicker frames. Anti-reflection lens coatings are available which help to reduce the glare from bright lights and are particularly beneficial when driving in the dark. Anti-reflection coatings can be applied to all lenses. If you need to wear glasses or contact lenses for driving its important to wear prescription sunglasses or clip-on sunglasses in sunny weather. It is not safe to drive if you do not wear prescription sunglasses. It also means that you are not legally fit to drive. If you are diagnosed with cataracts, glaucoma or another eye condition which is likely to make driving dangerous you must notify the Driver and Vehicle Licensing Authority. In many cases you will be able to continue driving but your optometrist (optician) will be able to give you more advice about this. If you have an accident and you have not declared your sight problem you may not be covered by your insurance. You will be issued with a licence for one, two or three years. You will then be reassessed after the licence period has elapsed. You should really consult your optician about this. They will ysyally be able to tell you about your options for driving etc. If, as a driving assessor a driver came to me wearing glasses and glasses were required for that driver to read a number plate at 20.5 metres but there is nothing on their licence to indicate glasses are required. Does that affect me going out with them to assess their driving?